Secure your deli meats and sausages with reliable reinforcements! Fasten your cured and prepared meats consistently with hog rings and hog pliers. 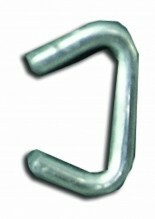 Galvanized blunt hog rings and spring-loaded pliers are used for closing tough sausage casings and meat bags securely. Relied on in butcher shops and meat packaging operations, hog rings can be used at home for those looking to store their flavorful homemade sausages professionally and securely! Don’t yet make your own sausages? A sausage stuffer is a small appliance that can make all the difference to your restaurant or grocery store. Hydraulic and manual models available.